VANCOUVER, BRITISH COLUMBIA--(Marketwired - May 10, 2017) - Skyharbour Resources Ltd. (TSX VENTURE:SYH)(OTCQB:SYHBF)(FRANKFURT:SC1P) (the "Company") is pleased to announce the Company's option partner Azincourt Uranium (TSX VENTURE:AAZ) ("Azincourt") has announced details for an upcoming exploration program at the East Preston Uranium Project. Their exploration program is slated to commence this summer / early fall with the purpose of locating new drill targets that were previously untested and refining other additional targets within the Swoosh corridor. Skyharbour and Clean Commodities recently entered into Option Agreement (the "Agreement") with Azincourt which provides Azincourt an earn-in option to acquire a 70% working interest in the East Preston Property (see news release dated March 28th, 2017). Under the Agreement, Azincourt has issued to Skyharbour and Clean Commodities each 2,250,000 common shares and will contribute cash and exploration expenditure consideration totaling up to CAD $3,500,000 in exchange for up to 70% of the applicable property area over three years. Of the $3,500,000 in project consideration, $1,000,000 will be in cash payments to Skyharbour and Clean Commodities. 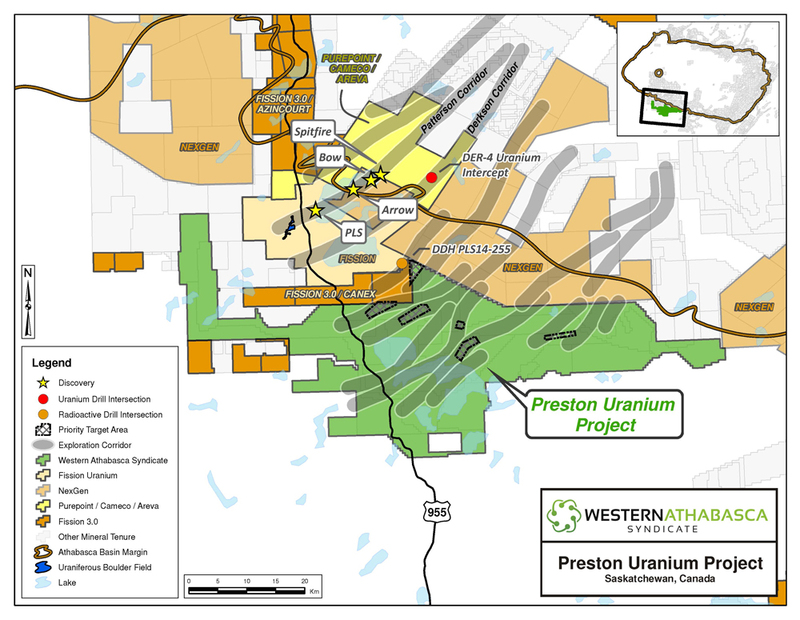 The Preston Uranium Project is a strategic, district-scale property with robust exploration upside potential throughout and is located near recent high-grade discoveries in the Patterson Lake area including NexGen Energy's Arrow deposit, Fission Uranium's Triple R deposit, and the Spitfire discovery. 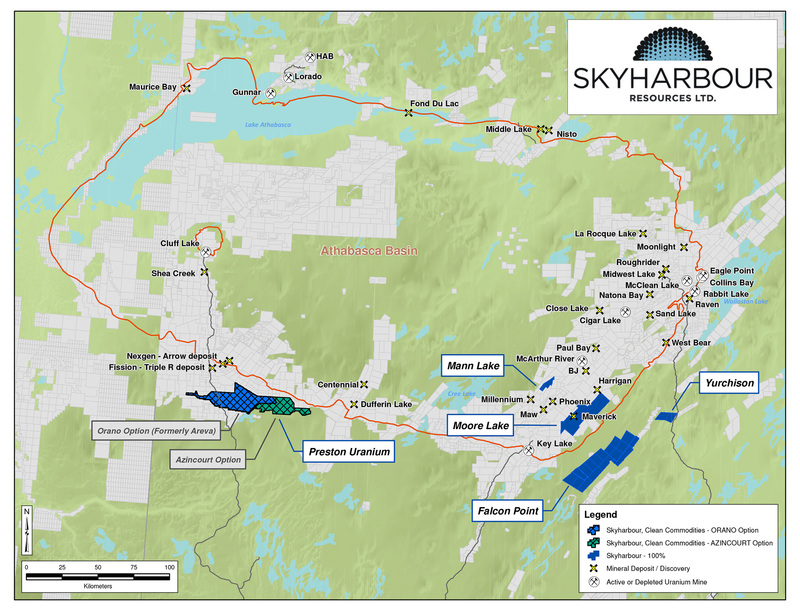 Skyharbour's President and CEO, Jordan Trimble commented: "Skyharbour continues to execute on its business model by adding value to its project base in the Athabasca Basin through focused mineral exploration at its flagship Moore Uranium Project, with final winter drill results expected shortly, as well as utilizing the prospect generator model to advance its other projects with strategic partners. The option agreement with Azincourt complements the other recent option agreement we signed with industry-leader AREVA Resources Canada and together the two option agreements combine for $9,800,000 in total exploration expenditures over six years, as well as $1,700,000 in total cash payments and the issuance of 4,500,000 shares of Azincourt split between Skyharbour and Clean Commodities in return for 70% interests in the respective property areas. We are excited to have Azincourt commencing exploration programs at East Preston shortly which will contribute to ample news flow for Skyharbour over the next year including Azincourt and AREVA's exploration programs at Preston as well as the Company's upcoming summer drill program at the Moore Uranium Project." Azincourt may earn a 70% interest in East Preston totaling 25,329 hectares, which represents the eastern region of the larger 107,278 hectare Preston Project through the upfront issuance of 4,500,000 shares as well as $3,500,000 of total project consideration over three years, including up to $2,500,000 of exploration work programs and $1,000,000 of cash payments to Skyhabour and Clean Commodities to be split equally. If carried to completion, a tripartite joint venture would be formed being 70% as to Azincourt and 30% as equally divided between Skyharbour and Clean Commodities. Azincourt's initial exploration program is budgeted at $250,000 and is being planned for completion by the fall of 2017 to allow for future winter drill target testing. The Preston Uranium Project is one of the largest tenure positions in the Patterson Lake region and currently consists of 107,278 hectares strategically located near NexGen Energy Ltd.'s high-grade Arrow deposit hosted on its Rook-1 property and Fission Uranium Corp.'s Triple R deposit located within their PLS Project area. In addition to the Azincourt Agreement on the Preston East Property, Skyhabour recently announced that it signed an option agreement with AREVA Resources Canada whereby AREVA may earn up to a 70% interest in a separate 49,635 hectare portion of the Preston Project. The East Preston property had extensive regional exploration work completed in 2013 and 2014 including airborne electromagnetic (VTEM), magnetic and radiometric surveys. Three prospective conductive, low magnetic signature corridors have been discovered on the property area. The three distinct corridors have a total strike length of over 25 km, each with multiple EM conductor trends identified. Ground prospecting and sampling work completed to date has identified outcrop, soil, biogeochemical and radon anomalies, which are key pathfinder elements for potential uranium deposit discoveries. Only one of the corridors has been drill tested to date, intersecting structurally disrupted graphitic metasedimentary rocks at the Swoosh S6 target using a combination of Horizontal Loop EM (HLEM) and gravity as primary targeting tools. Following positive technical discussions between Azincourt and Skyharbour's geological teams, Azincourt is planning to complete a summer / fall exploration program aimed at generating new drill targets within the previously untested corridors and refining additional targets along the Swoosh corridor. The proposed work to be completed will include re-logging and sampling of the seven diamond drill holes (1,571 m) drilled in 2014, with additional ground electromagnetic survey work (HLEM) and ground gravity planned along the airborne conductive trends. Additional ground geochemical sampling work is also being considered, but will be used to enhance any target areas identified from the geophysical surveys. The exploration work program planned is budgeted at $250,000 and is being planned for completion by the fall of 2017 to allow for future winter drill target testing. Furthermore, on March 9th, 2017, Skyharbour announced an option agreement with AREVA Resources Canada which provides AREVA an earn-in option to acquire up to a 70% working interest in a 49,635-hectare portion of the total 121,148 hectares Preston Uranium Project (see News Release dated March 9th, 2017). Under the agreement, AREVA can contribute cash and exploration program consideration totaling up to CAD $8,000,000 in exchange for up to 70% of the applicable project area over six years. Skyharbour holds an extensive portfolio of uranium and thorium exploration projects in Canada's Athabasca Basin and is well positioned to benefit from improving uranium market fundamentals with five drill-ready projects. In July 2016, Skyharbour acquired an option from Denison Mines to acquire 100% of the Moore Uranium Project which is located 20 kilometres east of Denison's Wheeler River project and 39 kilometres south of Cameco's McArthur River mine. Moore is an advanced stage uranium exploration property with a high grade uranium zone known as the Maverick Zone returning drill results of up to 6.0% U3O8 over 5.9 metres including 20.8% U3O8 over 1.5 metres at a vertical depth of 265 metres. Skyharbour and its partner Clean Commodities recently signed option agreements with AREVA Resources Canada and Azincourt Uranium whereby AREVA and Azincourt can earn in 70% on the Preston Project through a combined $9,800,000 in total exploration expenditures, as well as $1,700,000 in total cash payments and 4,500,000 Azincourt shares. Preston is a large, geologically prospective property proximal to Fission Uranium's Triple R deposit as well as NexGen Energy's Arrow deposit. The Company also owns a 100% interest in the Falcon Point Uranium Project on the eastern perimeter of the Basin which contains an NI 43-101 inferred resource totaling 7.0 million pounds of U3O8 at 0.03% and 5.3 million pounds of ThO2 at 0.023%. The project also hosts a high grade surface showing with up to 68% U3O8 in grab samples from a massive pitchblende vein, the source of which has yet to be discovered. The Company's 100% owned Mann Lake Uranium project on the east side of the Basin is strategically located adjacent to the Mann Lake Joint Venture operated by Cameco, where high-grade uranium mineralization was recently discovered. Skyharbour's goal is to maximize shareholder value through new mineral discoveries, committed long-term partnerships, and the advancement of exploration projects in geopolitically favourable jurisdictions.